Santorini is the island, formed over 3, 500 years ago as a result of powerful volcanic explosion. The total area of the island is 76 square kilometers, the capital is the town Fira. Santorini is considered one of the most beautiful and mysterious resorts not only in the Mediterranean but also throughout the world. The island is known for its unique landscapes, spotlessly clean sea, "colored" beaches and the hospitality of cozy little towns and villages. The classic Mediterranean climate prevails on the island all the year-round. There are occasional precipitation falls during summer period. In winter, even during the night the temperature allowes to have long romantic walks. Beach season starts in May, when the temperature rises to 24-26 ° C and does not end until early November. Santorini is a real jewel of the Mediterranean. The island is always included in the list of the most beautiful places on the planet and has dozens of prizes and awards from various international tourist publications, organizations and foundations. It is also one of the priority destinations for a honeymoon. The first cruise ships begin to arrive on the island at the end of March. The island's capital Fira with its marvelous architectural style stands out from the other islands of the Cyclades. There is greater number of buildings with vaulted ceilings and domes than anywhere else. Just imagine: a dazzling whiteness of the houses is broken only by the blue domes of churches and monasteries. One of the most famous churches of Santorini - Agiou Mina was built at the very rock cliff. It is the architectural landmark of the island, far beyond Greece. The remaining houses of Fira are situated in amphitheater style on the rocky slopes of the hills. Visitors of the island just love to live in a traditional Cycladic houses. Sitting at a table on the terrace, leisurely sipping local wine and watch the flood of exquisite sunsets on the horizon of the Aegean Sea - that is what is the true sense of harmony and peace during the rest in Santorini. The most beautiful and favorite among tourists place is the village of Oia, which is located at the very edge of the island. The village Imerovigli also attracts the attention of travelers, offering a beautiful panoramic view and the medieval village of Pyrgos, with picturesque architecture and centuries-old historical monuments. You can get acquainted with the underwater world of the Aegean Sea in an unusual tour around the island on a pleasure submarine. Amazing cultural monuments, exquisite architecture and incredibly beautiful landscapes invariably attract thousands of tourists in Santorini. Kamari is a luxury beach near the ancient city of Tyre. It consists of fine pebbles and black sand of volcanic origin. Near the beach there is a wide variety of bars, cafes and hotels. Perissa is conveniently located near the beach at the foot of Mount Musa Vouno. Rocks defend eight-kilometer coastline of the beach from the wind and entry into the water is very convenient. Its atmosphere is conducive to a calm, measured rest among family members and friends. Myths say that Santorini is the pinnacle of the past under the water island of Atlantis. For decades, historians from around the world are looking for proof of this legend and in the 60s of the last century during excavations on the island there were found whole ruins of the ancient city of the Minoan civilization. At the excavation site, near the village of Akrotiri, there operates the Archaeological Museum, where one can discover culture and architecture of the ancient world and enrich impressions from the historical museum in the town of Fira. An unusual and romantic image of the island causes incredible interest to acquire your own home in this part of Greek land. The properties in Santorini offer a wide range of different options: house, townhouse, villa, cottage and commercial real estate. The old white stone house on a hill with a beautiful view of the Aegean Sea are especially popular. Each year the island attracts more investors and developers, due to this fact its infrastructure is developing at the highest level. 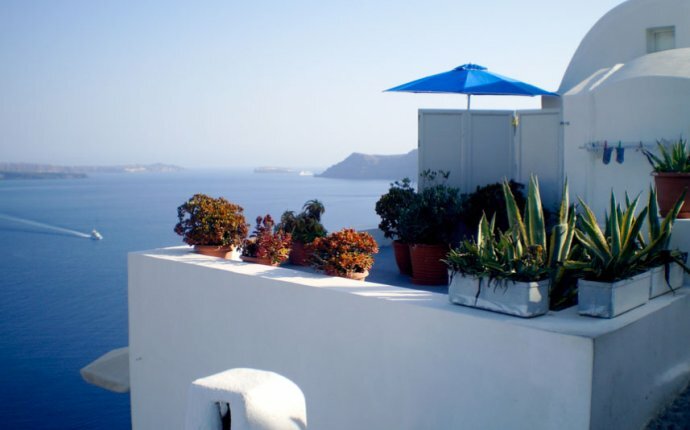 Buying a property on the island of Santorini is a profitable and promising investment. Thanks to Grekodom you have a unique opportunity to buy a property on the beautiful Santorini. You can apply to our company and experienced managers of Grekodom Development will help you to make your dreams come true and to acquire housing on the most beautiful island in the world. A private house in Santorini will be a part of your personal possessions of former legendary Atlantis!